Elegant pictorial wall chart from the GuideUs company showing the Munros, Scotland’s 282 mountains over 3000 feet (914.4 meters) high. 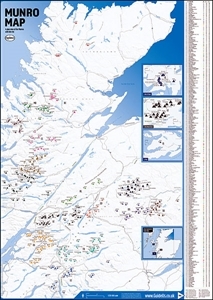 The chart (size 59.5 x 84cm / 23.5 x 33" approx) shows all 17 Munro groups, Loch Fyne to Loch Tay (FT), Loch Tay to Rannoch Moor (TR), Glen Orchy to Loch Leven (OL), Loch Linnhe to Loch Ericht (LE), Loch Ericht to Drumochter (ED), Drumochter to Glen Shee (DS), Glen Shee to Mount Keen (SK), The Cairngorms (CG), Glen Roy to The Monadh Liath (RL), Loch Eil to Glen Shiel (ES), Glen Affric to Glen Shiel (AS), Glen Cannich to Glen Carron (CC), Glen Carron to Glen Torridon (CT), Loch Maree to Loch Broom (MB), Loch Broom to Cromarty Firth (BC), Loch Broom to Cape Wrath (BW) and The Islands (IS). 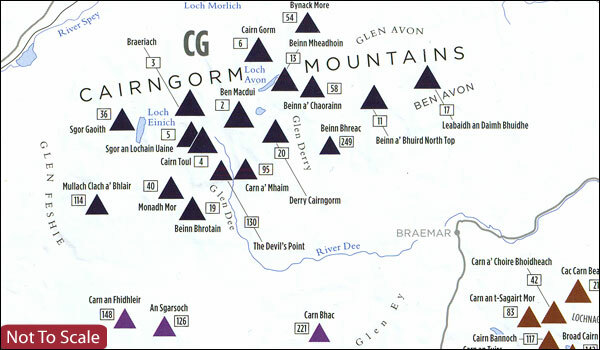 Each group is defined by a different colour, with an enlargement for the Ben Nevis area, plus insets for Mull and Skye to include Ben More and the peaks of the Cuillin Hills. The map shows the Scottish Highlands with rivers and lochs, main towns and cities, principal road and rail connections, plus major long-distance walking routes: the West Highland Way, the Great Glen Way and the Speyside Way. All the peaks, from Ben Nevis to Beinn Teallach, are numbered and cross-referenced to a table which lists the 282 mountains with their altitude in metres and feet, plus colour-coding for the group each Munro belongs to. The table also features a box to tick off each Munro as it is completed. The chart is printed on high quality 170gsm paper. Size: 59.5 x 84cm / 23.5 x 33" approx.